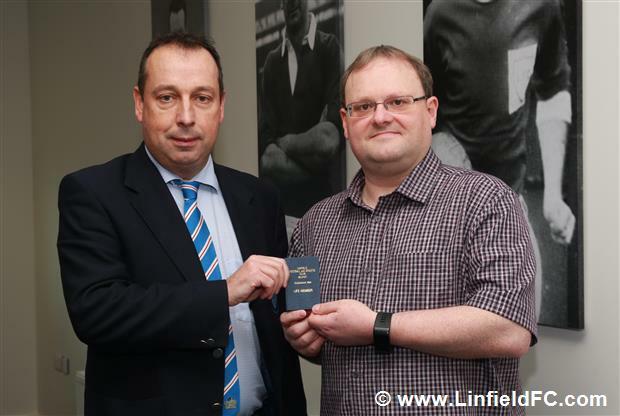 A very special presentation took place in the Windsor Park boardroom before yesterday’s Windsor Park game against Warrenpoint Town. The award of Life membership is the highest honour that this club can bestow on one of its deserving recipients and yesterday, the honour was awarded to Keith Lavery. Keith is one of the behind the scenes, unsung heroes who works tirelessly and without fuss in the background but without whom, the club simply wouldn’t run as effectively. As a loyal volunteer, Keith has spent hours and hours of his free time working for the good of the club over many years. Towards the start of this century Keith and Richard Carroll set up this Linfieldfc.com website and since then, Keith has maintained all technical aspects of this website, including a major revamp of this website a couple of years ago. When technical IT assistance is required, the message is always “ask Keith to do it” and he does. At the start of the season Keith extended this assistance to the club by looking after the match day scoreboard which has certainly enhanced the match day experience for our supporters. Keith’s contribution to this club has been immense and certainly, having a high Calibre technical expert readily available to help the club has saved the club an enormous amount of expense. Over many years he has been my ever dependable, always available right hand man on all technical issues and I am absolutely delighted that his superb contribution to this club has been recognised by my board room colleagues with this entirely fitting and appropriate recognition. 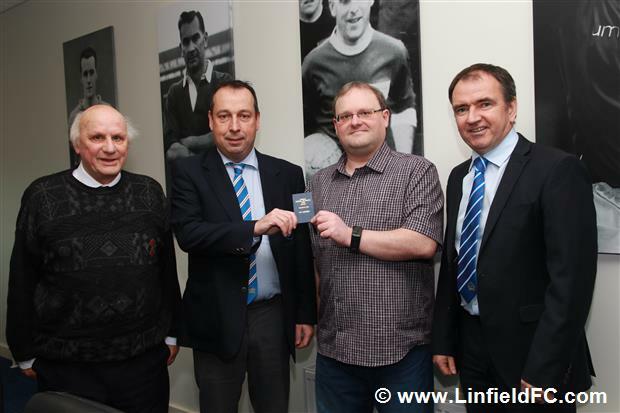 Joining Roy McGivern and Keith Lavery below are Linfield general manager Pat Fenlon and Keith’s father and another Life member - the Linfield chaplain, the Rev. Bill Lavery.